Avocado is not only beneficial for skin and health, but this amazing fruit has many benefits for hair as well that will surprise you. The oil of avocado is easily absorbed in the hair therefore it goes well with dry hair. Initially, the early Egyptians were the first to recognize its benefits for skin and hair, and now these benefits are well known. The Egyptians used this fruit to promote hair growth, prevent hair loss, add shine and luster to the hair. You can use raw fruit or avocado oil to get the rich vitamins and minerals. There are many natural avocado hair treatments to remedy different hair conditions. It works wonders when it is used as a hair mask. It nourishes as well as strengthens the hair. Read here for avocado hair mask benefits and how to make avocado hair masks at home. (i) Avocado Hair Conditioner: This creamy fruit acts as an effective natural conditioner for dry hair. It’s buttery and heavy. Message your hair with its creamy paste to get healthy and soft hair. It efficiently conditions dry and damaged hair. It also manages frizz hair to a satisfactory extent. (ii) Protects Hair: It works as a good protectant for hair from heat and chemicals. (iii) Avocado Hair Mask For Hair Growth: Avocado not only prevents hair loss, but encourages hair growth as well. Hair loss arises when the hair is extensively damaged and dry. Avocado is a great treatment for hair loss. Working as an effective moisturizer, it improves the hair condition to a great extent. (iv) Prevent Hair Split Ends: This buttery fruit hydrates dry and brittle hair effectively and thus helps in limiting the split ends. (v) Shiny Hair: Avocado has fats, omega 3 fatty acids and vitamins that are vital for shiny, smooth and beautiful hair. (vi) Avocado Hair Softening Mask: Avocado and egg yolk mask nourishes hair and make it soft and smooth. (vii) Moisturizes Scalp: Dry scalp can cause itching and other hair complications. The avocado hair mask or avocado oil can penetrate deep inside epidermis layer and keep the scalp hydrated. The oil inculcates the hair follicles, resulting into improving blood circulation in the scalp. The use of avocado mask helps detangling the hair without making the hair greasy. (viii) Revitalizes Scalp: Avocado hair mask or avocado oil rejuvenates and moisturizes the scalp. You can use variations of avocado treatments for hair, as it’s an excellent natural potent ingredient to revitalize dry, damaged, lifeless hair. Avocado acts as a deep hair conditioner, leaving the hair full of life, smooth and shiny. The bonus point is that it’s packed with proteins, amino acids and vitamins, thus the avocado oil or mask works to nurture the hair leading to healthier locks. (ix) Rich Source Of Vitamins B And E: One of the causes for hair loss and other hair related complications is deficiency of vitamins. Avocado fruit is a rich source of Vitamins B and E, and thus its application strengthen the tresses. It’s also known for its usefulness to repair scalp damage, which is one of the main causes of hair loss. (1) Avocado And Honey Hair Mask With Olive Oil: Honey is a rich source of vitamins that strengthen scalp and hair. Further it works as a humectant to make your hair strands retain moisture. Olive oil has excellent hydrating properties, so it protects your tresses from damage and very useful for those who use lots of heat on their hair usually. You can also add in a few drops of lavender essential oil, which is a natural treatment for scalp that helps get rid of dandruff and itchy skin. Moreover, it adds a feel good smell to the mask. It’s one of the best hair masks for dry hair!! (i) Take 1 ripe avocado (pitted and scooped out), 2 tablespoons of honey, 2 tablespoons of olive oil and couple of drops of lavender essential oil (optional). (ii) Mash the avocado until it forms a smooth paste without any lumps. Mix all the ingredients in a mixing bowl, and blend them all together, until the mixture forms a smooth paste of uniform consistency. (iii) Damp your hair with water, and apply the mask onto your hair, paying extra attention to the hair ends. Massage the mixture a little bit. Clip your hair onto the top of your head, and then cover with a shower cap. Allow the mixture to sit for about 40-45 minutes. (iii) Remove the shower cap, rinse your hair thoroughly as many times it requires removing the mask entirely, and then wash and condition your hair as you normally do. (2) Avocado And Banana Hair Mask – Deep Conditioning Treatment For Dry Hair: This recipe can even maintain your naturally curly hair glossy. (i) Take 1 ripe banana, 1 ripe avocado, 1 tablespoon of olive oil, and a few drops of your favorite essential oil, such as lavender, rose, sweet orange or jasmine. (ii) Blend the ripe banana and ripe avocado together, until they form a smooth paste without any lumps. Put the mixture in a mixing bowl; add in olive oil and 2-3 drops of essential oil. Stir all the ingredients together until you have a smooth mixture of uniform consistency. (iii) Damp your hair with water, and apply the mask onto hair – including scalp if you want, paying extra attention to the hair ends. Massage the mixture a little bit. Clip your hair onto the top of your head, and then cover with a shower cap. Allow the mixture to sit for about 15 minutes, longer if you prefer. (iv) Remove the shower cap, rinse your hair thoroughly as many times it requires removing the mask entirely and then wash and condition your hair as usual. .
(3) Avocado, Egg Yolk Hair Mask: This mask has number of benefits for hair. Use this mask for volume, growth and conditioning of your tresses. Avocado and egg yolk are also very effective for softening, hydrating and conditioning hair naturally. (i) Take 1/2 ripe avocado, 1 egg yolk. You can use a blender to blend the avocado and egg yolk, until they turn into a uniform paste without any lumps. Or you can whisk the egg yolk until it forms a frothy liquid, mash the avocado until it turns into a lump-free paste, and then mix the two together. (ii) Damp your hair with water, and then apply the hair mask with your fingers starting from your scalp and working all the way until you reach hair ends. Massage the mask gently into your scalp for few minutes to stimulate blood flow. Let the mask sit for about 15-20 minutes, longer if you desire. (iii) Rinse your hair thoroughly, as many times as needed to remove all the traces of the mask. Shampoo your hair, condition and rinse your hair as you normally do. Natural Beauty Tip: When using any mask containing egg, never use hot or warm water on your hair, as this will cook the egg and you will be stuck with egg bits in your hair. (4) Avocado And Olive Oil Hair Treatment: If your hair is dry, damaged and frizzy, use this soothing home remedy with olive oil and avocado as two ingredients. You can use this mix as avocado deep hair conditioner to moisturize your mane and restore its lustrous shine. Both these ingredients have moisturizing qualities and will leave your hair looking shiny and feeling soft. Avocado has biotin, a vitamin that helps to strengthen your hair. Olive oil smooths frizz, nurses hair damage and helps in removing tangles. (i) Take 1 ripe avocado, 1/4 cup of steel-cut or rolled oats, 1/8 to 1/4 cup of olive oil and 1 cup of milk. Mash the avocado into a lump-free paste and mix it with 1/4 cup of oats. Add in 1/8 to 1/4 cup of olive oil, depending upon the extent of dryness of your hair. Mix in 1 cup of milk and stir thoroughly all the ingredients together, until the mixture turns into a smooth paste. (ii) Apply the mask onto your hair, starting from the scalp till the hair ends. Wait for 30 minutes, and rinse the mask out with water, as many times as needed to remove all traces of the mask. You may then shampoo and condition your hair as usual. (i) While making an avocado or any fruit mask, blend or mash it thoroughly into a lump-free paste. If you have small fruit bits in your mask, it would be difficult to wash them out entirely. If you face such a situation, simply use a comb to remove the bits. It’s a tiresome process, but you will get the job done. (ii) If you have oily roots then don’t put the avocado mask onto the first inch or so of your hair. On the other hand if your hair is dry or frizzy, spread the mask all over your hair and scalp. Pay special attention to the hair ends, as that is where your hair is mostly damaged. (iii) If your hair is thin or limp, skip the deep conditioning masks, as they tend to weigh your hair down. 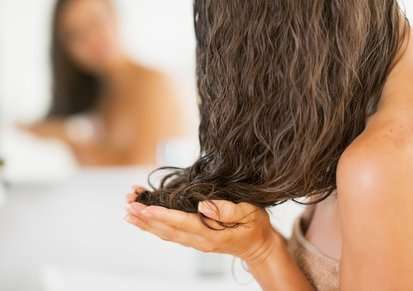 (iv) Always try to dry your hair naturally, without using a hair dryer to avert damaged, frizzy hair. Are you not happy to know the above best avocado hair mask recipes? I haven’t tried an avocado hair mask, but it sounds great! Awesome article! Avocado Oil is truly a miracle worker for hair. I’ve been using avocado oil in my hair for a couple months and the difference is amazing! I suggest Aviva Pure Avocado Coconut Oil Hair mask. I use it once per week. I use it often it works great! Thank you so much for sharing your experience……. I opt to use TRL hair growth oil in place of other oils because they have a combination of several oils and herbs in one bottle. It’s the only oil I ever need, Killing not two but twelve birds with one stone. Raw avocado and honey , olive oil mask worked wonders on bleached hair! No need for expensive salon treatments . I will NEVER do this again. I finally got around to trying an avocado hair mask with an avocado I let get too ripe to eat. I used the whole avocado, olive oil, and a little honey. I mixed it and mashed it very very well, until it appeared to be a smooth and creamy paste. Putting it in my hair was one of the most disgusting things I have ever done. It looked gross, smelled gross, felt gross, and still had all these chunks of avocado that somehow managed to fall out of my hair and get all over the sink and floor, even the wall (?). BUT, I put up with it for over an hour, sitting outside around the pool with a shower cap on my head. When I washed it out of my hair, there was a whole new level or grossness. Greenish gray chunks falling out of my hair and all over my white shower floor was puke provoking. I seriously had to keep my eyes closed! When I thought there couldn’t possibly be anymore chunks in my hair, I shampooed and watched more chunks fall out of my hair. After 2 shampoos and a conditioner, I finally finished up by using a shower comb and called it quits. I was never so happy to be through with something in my life! I was just hoping that I was going to have gorgeous locks when all was said and done. Did that happen? NO! I didn’t see one bit of difference in my think, naturally curly (with a propensity to frizz), strawberry blonde hair. And even if I had, it would never in a million years be worth it. I may never eat another avocado, and for that I am truly pissed. This mask works effectively to repair dry, brittle or damage dry hair. What you need to do is mash one nice, ripe avocado (use it’s flesh only) and add one tablespoon of honey and two tablespoons of olive oil and blend/whisk it till it’s chunks free smooth paste.Then use this mask. This mask works effectively to repair dry, brittle or damaged hair. You need to blend/whisk one ripe avocado (use it’s flesh only), two tablespoons of honey and two tablespoons of olive oil till you get a totally chunks free, smooth mixture. Then only use this mask. I know Avocado hair mask is very messy and it does not suit many people. Your hair seems to be super dry. Try these easy-to-do and simple hair masks, especially formulated for super dry hair. I tried the avocado honey and oil mix. I made sure it was smoothly combined, I left it in my hair for an hour, and I rinsed it out well. It did nothing. It didn’t feel better in the slightest, if anything it made my hair more rough. Ive done this before and it makes my puffy naturally curly hair very shiny. Unbelievably so. I flatiron a lot so the extra conditioning really helps. I did giggle though that the Egytians supposedly used Avocado. Its native to South Central Mexico – so I dont think the Egyptians would have had it ;). Will the avocado/egg yolk hair mask strip the color from my hair? Extract lemon juice from 2-3 lemons. Shampoo your hair as usual. Let the lather sit for 4-5 minutes. Add lemon juice, work all in together, but don’t rinse. Let the lemon work for another 3-5 minutes. Apply a good quality hair conditioner. Let this stay on for additional five minutes. Repeat when needed. Since this method is natural and organic, you can repeat as needed. It will slowly and more naturally change a permanent or semi within a week to two slowly, so that it seems like your hair is growing back naturally instead of drastically changing. Along with the above remedy use avocado/egg yolk hair mask to keep your hair healthy. Hi, just have a question,please could you explain me clearly.. Mine is oily scalp n dry hair,can I use avocado for hair. Yes, you can. But make sure that you apply the avocado hair mask 1 to 2 inches away from the hair roots. I hope now it’s clear to you. That’s your personal choice and also depends on your hair type. Read the article thoroughly and you will find the answer.